The Church of St. Mary Thrimby is situated in the rural farming village of Little Strickland. It is a medieval church, first restored in 1686, then in 1813 moved from the original position near the river, to the centre of Little Strickland. It is in a reasonable state of repair with a churchyard still open. There are approximately twenty houses with three working farms. The population is a mix of working families and retired people. As Little Strickland school was closed in 1976, the primary aged children now go to Morland Church of England primary school. For secondary education there is the option of Penrith or Appleby. There is a timber-frame village hall used for various social functions, but no shop or public house, these having closed many years ago. With eight regular attenders at services out of some sixty-five on the civil electoral roll, our church attendance is 15% of the population – roughly five times the national average. 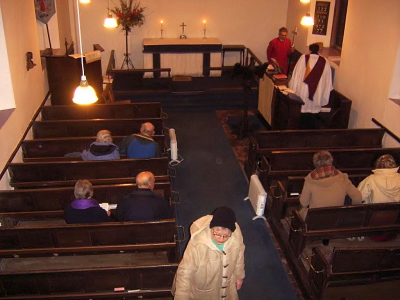 Thirty services were held during 2009 with an average attendance of twelve, swelled by Joint Services, five of which were held in Thrimby during the year. Over the last nine years six funerals, two baptisms and one marriage have taken place. The PCC comprises six members, all of whom are over sixty. The total unrestricted receipts to church funds this year was £1640. Our Parish Offer, however, was met thanks to various fund-raising events. Although adhering to middle churchmanship, using traditional hymns (Hymns Old & New) with some popular new ones, we aim to be as inclusive as possible regarding ‘rites of passage’, accommodating those requesting church weddings and baptisms and including the re-marriage of divorcees. We also value the opportunity we have had to have a discussion within our service instead of a sermon from time to time. Coffee evenings are held monthly with a small “bring and buy” and raffle, and we have a bi-monthly discussion group considering various religious and ethical questions, recently looking at the “Living the Questions” DVDs. Other activities include history days, Christmas meals and various Open Gardens, quiz nights, village breakfasts etc. all of which are well supported by the whole village. 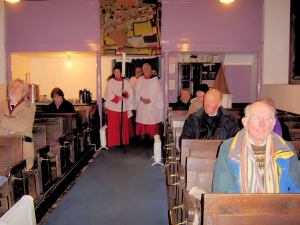 We hope to continue to combine village and church activities and indeed in the longer term, not restrict the use of the church building solely for church services. As a parish within a multi-parish unit, we wish to retain our own identity whilst keeping the close links and relationships which have developed in recent years with the other parishes in the group.